First batch available at ShareCG and Renderosity. I've removed all my freebies from Renderosity. Upload was announced in post #40, so check the lead-up to that post for more background. 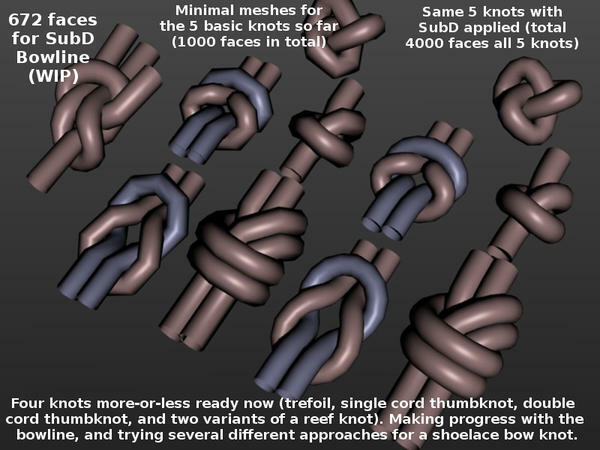 For one of my ongoing projects I ended up mesh-modeling a simple dual-cord thumb-knot (since I've been unable to find any freebie unrestricted use OBJ knots). 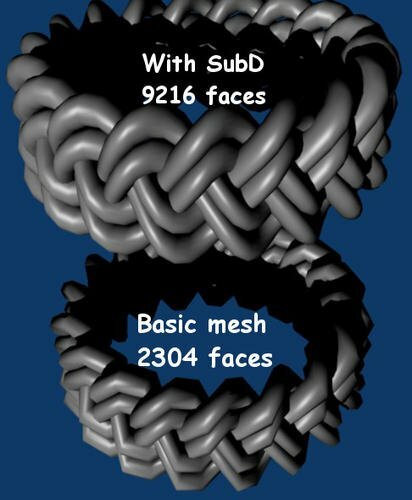 The attached image is a Poser 6 render of this 208-face model from various angles (with smooth polys, displacement, cable shader, etc applied) - I was gobsmacked that something so simple could look so effective! More info about the one I've already done on my blog here - Ideas - a knotty problem. I didn't think it was really worth uploading as a freebie on its own, but if I can add a few more, maybe some cable ends (eye-loop type things) too? I don't need much encouragement Wendy - one positive reply's good enough for me! Second knot done - simply removed one cord from the original knot and fiddled a bit to get a reasonable single cord overhand knot (not a thumb knot, which is what I always called it). 152 vertices/144 faces for this one. Blender screenshot attached. 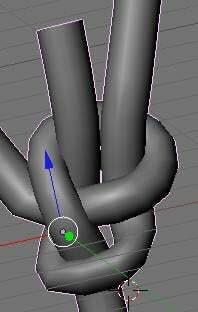 SubD works beautifully on the two knots I've done (at least in Blender using Catmull-Clark multires, and in Poser using Smooth Polys on the render settings). Regarding the models themselves - I assume that the eight vertex cylinder I've used so far as a basis for the cord(s) is okay as a starting point for you? Any specific knots you're interested in? A straightforward bow/shoelace knot (like Amy's) would be an obvious one to start with I guess. And I remember a fair bit about knots from my time in the cubs/scouts, though a lot of my recollections are rather frayed and need splicing! No promises, but I'm rather enjoying this and while my enthusiam's going it would be good to focus on knots that people actually want! "the eight vertex cylinder I’ve used so far as a basis for the cord(s) is okay as a starting point"
That would be fine - gives me something to work from. Any knots that would be used on clothing really. Those on bows, belts, laces, scarfs etc. 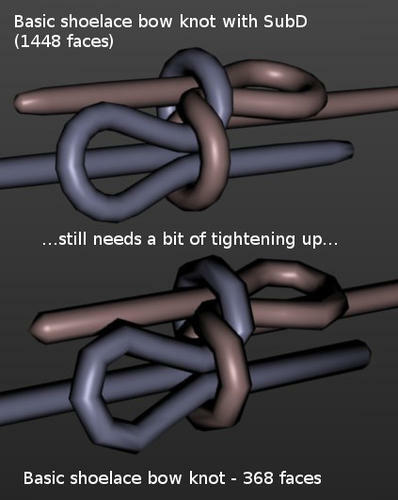 Are you aware of Knot Tyer 3D? It may be helpful. I haven't delved into it too deeply myself. First attached image is a DAZ Studio 3 screenshot of the imported OBJ (right), and the same imported OBJ with SubD applied (left). Just downloaded it and given it a quick test run. I just downloaded that too. You can save as .obj file, but when I loaded that into Silo none of the vertices were welded together. As soon as I applied subdivision it broke apart. Yes they are too loose as well. My quick test run was obviously a little too quick! - it's using an 8-vertex circle rope profile. Great, just what I want. - There's loads of duplicate vertices (that'll be the problem you had). Doing a 'remove doubles' in Blender deletes 4240 of the 5664 vertices, leaving 1416. - Multires/SubD works fine after removing doubles (see attached image), so you need to do the equivalent when you import into Silo. That's it for tonight - I'll try stripping down and rebuilding the bowline tomorrow. Thanks Bob, I think you hit on a good'un there! Cool. I couldn't get Gordian Knot to run for me at all. As you say, Knot Tyer is meant to illustrate how to tie knots rather than make them, and although I knew there would be ways round the looseness I hadn't investigated further. 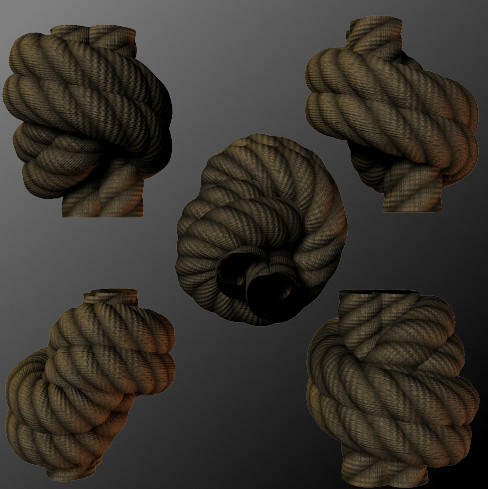 With the 'stranded'/'twist' shader...rope, cable and now knots are easy. The one in the Railings02 freebie I recently uploaded. Nothing fancy or clever, just a simple equation based around the sine function... f=abs(sin(50U+5V)) . 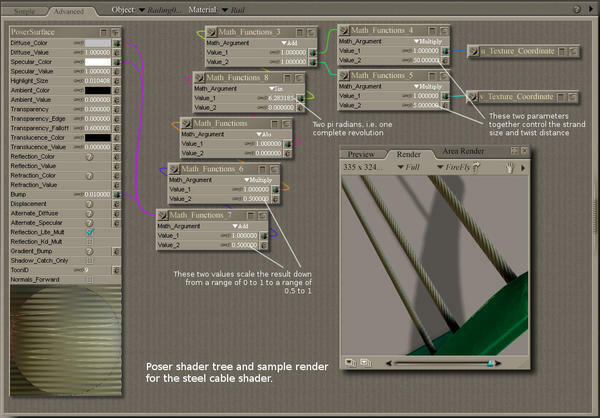 Here's a screenshot of the Poser shader if you just want to do it yourself. 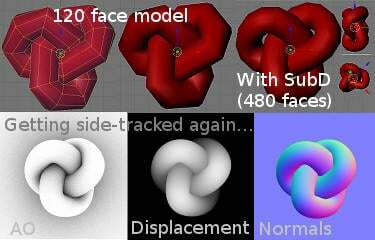 There's a bit more info about ways to do the shader in DS here, and there's a DAZ Studio version in the freebie too. After a play around with the bowline I think that KnotTyer3D is a great starting point! Here's a first stab at reducing the poly-count of the bowline - 1416 faces in the imported OBJ (after removing doubles), 184 in the pared-to-basics version. An experienced modeler could probably tighten up the knot quite easily with the imported OBJ, but for the likes of me - the less vertices to keep track of, the better! That low-poly one is proving quite easy to tighten up by manipulating one edgeloop at a time. It's mainly a fine-tuning process- select an edgeloop, adjust the view so it's edge-on, rotate it about its centre,move it a bit, pick another edge loop, etc. Using loopcut is a no-no for me here since the new loop isn't circular (or regular octagonal to be precise). If I need another edgeloop I'm finding the best way is to delete the edges that I would have cut, extrude one of the exposed edge loops, then skin the faces between the new edgeloop and the other exposed one. Here's the bowline after a little making some corrections and tightening it up a bit. Still not there yet, but it's proving the principle. ...one level of multires applied within Blender takes us up to 1504 faces, so similar to the imported OBJ. 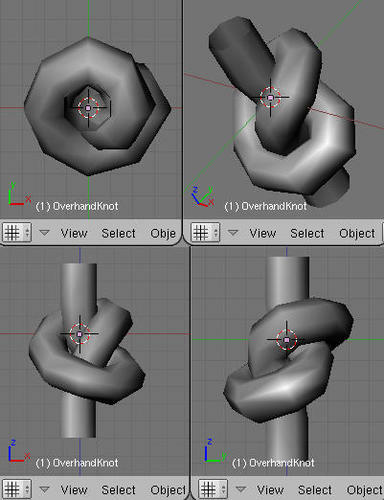 The basic model need a bit more work, but this looks like a nice and (relatively) easy way to do knots! I had a few unsuccessful attempts to use it in the past - download, install it (or was it a standalone? It's on my old laptop so I can't recall), run it - nothing happens, no window, nothing. A couple of months ago I downloaded it again, and for a change read the instructions too! So this time I also installed the DirectX End User Runtime from the Microsoft site as instructed here, bottom of the page - and that did the trick for me. Any updates on the knots? Whoops - already nearly a month gone but I've been spending all my time on other projects*! Thanks for the reminder - I should be able to devote some time to them this week. Back on the knots now! A basic trefoil knot* using 120 faces. With one level of SubD (so 480 faces) it looks quite nice (although the SubD opens up some gaps. Still, that's easy to fix by moving the outer loops toward the centre. *Not the sort of knot that's easy to tie in the real world! If you've got any comments/suggestions don't hold back! ...and here's the basic shoelace bow knot. Still needs a fair bit of adjustment. I am very, VERY impressed and offer my congratulations. If I may make a suggestion, a good Turkshead would - and does - find an enormous number of uses in decoration, etc., but it would tax your computer skills to the very limit. I tried once, starting with a simple sphere and texturing it, but my effort does not stand close scrutiny. As you may know, I use Blender. I'm using the similar technique too. 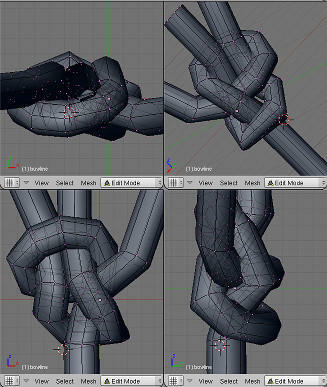 It is hard to make a nice low-poly knot. Good work! skipper25: Thanks Skipper. I googled 'turks head knot' and there's quite a variety! I'm a great believer in the KISS (Keep It Simple, Stupid!) approach, and the simplest way to start seems to be a flat plait - the one on the attached image is really simple. Wendy: Glad I'm on the right track. I think I'll include the simple plait in the first batch too - I can see it being handy for belts and stuff. Amy: Thanks! A few years ago when I was new to all this, a 'tutorial' of yours was one of the things that got me started - so many, many thanks for that too! I've been trying out a variety of techniques, and what works best for one knot may not be best for another. A bit of lateral thinking often helps (e.g. did you realise that a shoelace bow is actually a reef knot with one of the loose ends of each cord passed back through the existing loop?) , and a willingness to completely scrap one idea and start again from scratch (and to do that many times over!) is essential. Working with a low res model makes the starting all over again bit much, much easier! 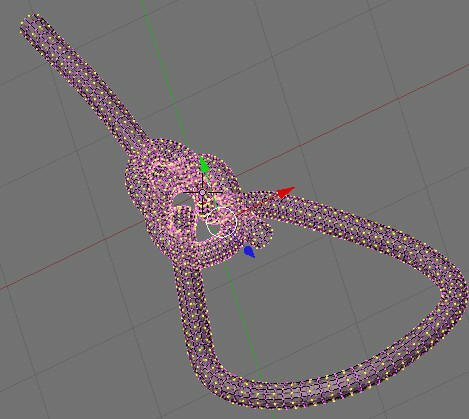 - For the bowline I'm still going with the cut-down output of the KnotTyer3D-generated OBJ (from the built-in Bowline.kt3 model). But I may still scrap it and start again from scratch! 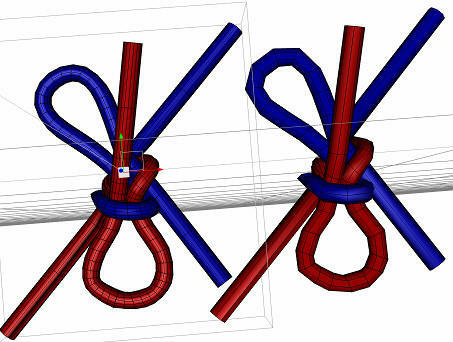 - The double-cord thumbknot and trefoil were created by extruding a double/single 8-vertex circle and manually positioning/orienting each extrusion. - The single-cord thumbknot was created by deleting one cord from the double-cord version and iteratively adjusting each circular edge loop in turn until it was tight again. - The reef knot started as an eight sided torus with one circular edge loop ripped and extruded to give the two ends. - For the shoelace bow (and after many false starts) I went with three cylinders poking through a torus as a starting point! One thing common to all the knots is that once the basic shape is set up it's an iterative process to tighten up the knot and fine tune the shape. I'm finding that I usually view the knot from all angles, pick the circular edge loop that looks worst, and adjust it's position and rotation (about whatever axes are necessary) until it looks 'better'. Then look again, pick the worst loop again (hopefully a different one! ), etc. Note: for all the current knots I'm deliberately modelling the whole cord. For many purposes this will probably be overkill (e.g. a shoelace bow will usually be tight up against the shoe, so the half-knot on the underside is unnecessary). 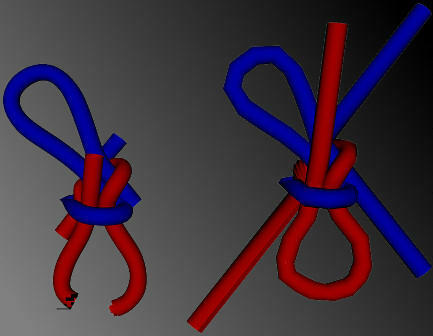 So even simpler versions of the knots are possible, and perhaps even more useful. It's far from perfect, but it's also far better than I'd expected! So I think I'll include the OBJ for this in the first batch too!